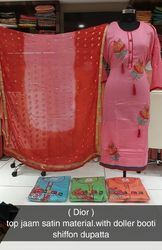 Our product range includes a wide range of designer dupatta suit, ladies dress material, ethnic designer suit, stylish salwar suit, fancy salwar suit and fancy silk suit. Astonishing rani embroidered work semi stitched suit paired with unstitched salwar & matching designer dupatta. 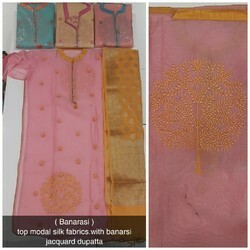 Gorgeous pink embroidered work semi stitched suit paired with green unstitched salwar & matching dupatta. Magnificent yellow embroidered work semi stitched suit paired with unstitched salwar & red matching designer dupatta. Astonishing Red embroidered work semi stitched suit paired with unstitched salwar & matching designer dupatta. Decent white embroidered work semi stitched suit paired with green unstitched salwar & matching dupatta. With our vast experience in the industry, we are able to manufacture, export and supply an optimum quality . Our Fancy Ladies Suit is made of excellent quality fabrics sourced from our known and reliable vendor base. Awesome peach embroidered work semi stitched suit paired with unstitched salwar & matching designer dupatta. 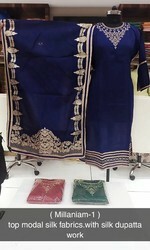 Beautiful Red & Blue embroidered work semi stitched suit paired with unstitched salwar & matching designer dupatta. 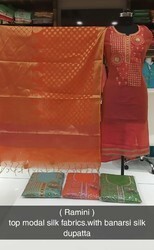 Chanderi Silk Salwar Kameez offered come in glorious designer patterns and can be made available in different color prints. Having in them a touch of class and exclusiveness, these ladies suits create for unique styles as well as highly presentable dressed looks. 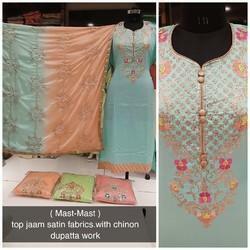 Stunning light green embroidered work semi stitched suit paired with rani unstitched salwar & matching dupatta. Elegant dark pink embroidered work semi stitched suit paired with unstitched salwar & designer dupatta.